If you are involved in the pro-life movement for any length of time, you will encounter the image of Our Lady of Guadalupe. There are many connections between this particular image of Our Lady and the pro-life cause. On December 12, 1531, the Blessed Virgin Mary appeared to an Indian named Juan Diego and requested that a shrine be built and dedicated to her on the Hill of Tepeyac. Juan Diego, upon reporting this event to the bishop, was disappointed because the bishop didn’t seem to believe him. Juan returned to the place of the apparition where Our Lady again appeared. She told him to return the next morning when she would give him a sign that would convince the bishop of the truth of her appearance and her request. The following morning Our Lady told Juan to go to the top of the hill and gather Castilian roses that he would find there. Although he knew that only cactus grew there, he obeyed, and his simple faith was rewarded by the sight of beautiful roses growing where she had told him they would be. He gathered them and showed them to Our Lady who rearranged them for him. Juan returned to the bishop. As he opened his tilma (a type of pancho), the roses fell to the floor. All who were present were startled to see an image of Our Lady on the tilma. Today this image is still preserved on Juan Diego’s tilma, which hangs over the main altar in the basilica at the foot of Tepeyac Hill just outside of Mexico City. In the image, Our Lady is pregnant, carrying the Son of God in her womb. Her head is bowed in homage, indicating that she is not the Goddess, but rather the one who bears and at the same time worships the one true God. Many articles have been written on dozens of other theological lessons drawn from the details of the image. When asked who the lady was, Juan replied in his Aztec dialect, “Te Coatlaxopeuh,” which means “she who crush the stone serpent.” His answer recalls Gen. 3:15 and the depictions of Mary as the Immaculate Conception, her heel on the serpent’s head. The devil exalts himself above God and above God’s law (see Isaiah 14:12-15), whereas Mary submits to God (see Luke 1:38). Some promote abortion as a “choice.” Self-will is exalted. We reject abortion because we, like Mary, submit all our choices to God. That spirit of obedience crushes evil and sin. Our Lady’s image reminds us to live in that obedience each day. 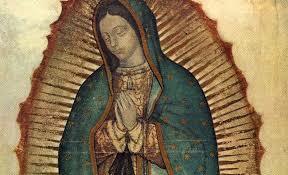 Some nine million Aztecs were converted to Christ by the power of the image of Our Lady of Guadalupe. At that time, the Aztec peoples were practicing human sacrifice. As a result of the image’s presence among the people, their hearts were converted to the true God and the practice of human sacrifice was abolished. A key theological dynamic operating here is that Our Lady turned the Aztecs from a worldview of despair to one of hope, from a conviction that the gods were against them to a conviction that God was so much for them that He became one of them. We can listen to stories of Aztecs cutting out their victims’ hearts or placing their heads on poles and say, “Oh, how terrible that was!” But America is not doing any better, as the hearts and heads of innocent babies are destroyed by abortion! The image is therefore being used again to change the hearts of our people. The Aztects had a complicated mythology-theology. The universe for them was essentially unstable, and in that universe humans played a very small role. This view led to pessimism, and a fear that they needed to always appease the deities. Their view was that the present world was the “Fifth world,” made by the “Feathered Serpent.” The previous four worlds had been destroyed by gods who turned people into monkeys or dogs. The present world, they thought, would be destroyed by an earthquake, as a result of which skeleton creatures would come out of the ground to destroy the surviving inhabitants of earth. This is a theology of despair. Whatever moral aversion they may have had to human sacrifice, their despair made them feel they had no choice but to practice it. How does the image of Our Lady of Guadalupe answer the theology of despair, both for the Aztecs and for the Americas? Our Lady is carrying God within her womb. The God of the Universe has now become a human being. No longer is there any question as to whether God is on our side. He is not a God who will destroy us; He is a God who has become our brother. He is not a God far away who waits to be appeased by blood. He is a God who shares our own flesh and blood, and is as close to the human family as an unborn child to his mother. The image speaks to these girls a message of hope. It also speaks to the pro-life people a message about the task before us. We who fight abortion do not see abortion walking down the street. Instead, we see a girl, frightened and in the grip of despair. We, the Church, are to reach out to her in what is the most critical pastoral mission of our day. That mission is illustrated by the Annunciation and the Visitation. When Mary is told she will be the Mother of Christ, she does not get wrapped up in herself, thinking about what has just been said and isolating herself from others in order to absorb some unique spiritual experience. Rather, she seems to pay more attention to what Gabriel said about Elisabeth, Mary’s cousin, that about Mary! She runs in haste into the hill country and tends to Elisabeth’s needs during her pregnancy. The message for us is that authentic religious experience and true worship never turn us in on ourselves. Rather, the more real our encounter is with God, the more attentive and responsive we are to the needs of our brothers and sisters. Our Lady of Guadalupe has been declared the “Patroness of the Unborn.” They will be saved by the message of hope she brings, and by the message of concrete charity with which she challenges the Church. Among the many and varied groups that carry out this pro-life mission, one of special note in this context is “Indians for Life.” The outreach department of the National Right to Life Committee, as well as Priests for Life, have fostered and encouraged the growth of this yet small organization, coordinated by Clementine “Little Hawk” Hernandez. Archbishop Charles Chaput, OFM Cap., has been among the strong supporters of this effort, which gives concrete expression to the reverence of Native Americans for the gift of life. When Our Lady appeared to Juan Diego, she addressed him as “Juanito” (signifying the weakest or smallest member of the family), and as “Son”, and spoke of herself as both his “Mother” and the “Mother of the One, True living God.” All of this indicates another reason why Our Lady of Guadalupe should be entrusted with the unborn. This entry was posted on Tuesday, December 12th, 2017 at 4:46 pm	and is filed under News & Commentary, Uncategorized. You can follow any responses to this entry through the RSS 2.0 feed. You can skip to the end and leave a response. Pinging is currently not allowed.